Interest in more durable farm-to-market linkages along the food value chain continues to grow. A key component for making these market linkages is having accessible points of aggregation and distribution. Regional food hubs have developed in Virginia and across the country to serve this purpose. 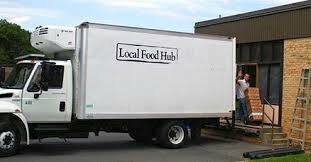 Food hubs are a critical food system link and an accessible point for producers, processors, and distributors to retail, wholesale, and institutional markets. The Local Food Hub in Charlottesville, VA serves as a critical link for regional farmers and businesses in central Virginia.